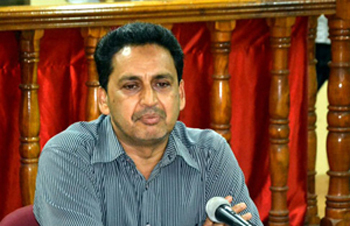 Mangaluru, June 10, 2016: The district administration has permitted storage and transport of sand in the district between June 16 and 21.DK Deputy Commissioner Adoor B Ibrahim, who addressed media at the court hall in his office at Mangaluru on June 9, Thursday, said that 19 sand bars have been identified in the CRZ area, which covers Netravathi, Phalguni and Nandini rivers. "As sand mining is banned from June 16 to August 16, the permit-holders are allowed to store the mined sand at units and to transport the sand within the district limits from June 16 to 21," he said. The DK DC, clarified that the transportation of sand to other districts is strictly prohibited. "In addition, it is mandatory for all permit-holders in the CRZ area to install GPS to the sand transportation vehicles," DC said. Clarifying further, the DK DC Ibrahim said, "Government orders stipulate, sand mining in the sand blocks of the non-CRZ area, is also banned. Sand mined from 13 identified sand blocks - out of the 38 blocks in the non-CRZ area - has been stored in identified stockyards, after obtaining the clearance certificate from the authorities concerned." The DC clarified that seven special investigation teams and five static surveillance teams have been formed in the district to find and stop the cases of illegal mining and transportation of sand. "CCTV cameras have been installed at checking points. The cameras are linked to the office of the Superintendent of Police," he added. Listing out cases of illegal sand mining, DC Ibrahim said that there were 309 instances of illegal sand mining in 2015-16. "Cases are pending against five of the violators and a fine of Rs 47.742 lakh has been collected. In 2016-17, we have found 22 instances of violation and cases were booked against one of them. The fine collected was Rs 4.180 lakh," he mentioned. "In connection with sand transportation, 1,134 instances of violation were found in 2015-16 and cases were booked against 40 of them. A fine of Rs 1.45 crore has been collected. In 2016-17, 149 instances of violation were found and cases were booked against seven of them. The fine collected amounts to Rs 21.920 lakh," the officer added. "A letter has been written to the RTO, Regional Transport Department, to cancel the licences of the owners of 77 vehicles, which were seized by the police officials for illegal mining and transportation of sand. The licences have been temporarily cancelled" he said.